Wellington is New Zealand’s third largest city, and since 1865 has been its capital. Nestled between rolling hills and a stunning harbor, it has a vibrant and compact downtown area. Upon arrival in the Bay of Islands you will be transferred by private vehicle to your accommodation. Your resort offers stand alone cottages with private balconies in the heart of Russell, a tranquil, quaint and historic New Zealand town. This afternoon is at your leisure to settle into your new surroundings. Tonight we recommend Russell’s best dining experience. A celebrated restaurant on the waterfront, featuring Pacific Rim cuisine. Today enjoy a luxury boat cruise through the Bay of Islands. Your private sailing boat is fast and nimble enough to explore the waters with ease, yet has the comfort, safety and style to provide an exceptional day on board, enjoying the breeze and the view from the covered deck. Guided by the professional and knowledgeable crew, enjoy beach combing and lunch served in a sheltered cove. As you cruise the stunning harbor, you will also learn about the significance of the Maori and maritime history in the area. This amazing 54 ft sailing catamaran offers a totally unique way to experience New Zealand’s world famous Bay of Islands. Enjoy level sailing, all-round visibility and lots of comfortable space, inside and out. The boat’s gleaming blue-green hull stands out among her peers. The owners are experienced skippers. They know New Zealand’s cruising areas and diverse marine life well and enjoy sharing their knowledge of hidden places with others. For dinner this evening we recommend a popular restaurant, situated on the waterfront in Russell. Dine in the outside courtyard while watching the sun set on romantic Russell, or soak up the ambiance of the indoor dining room. Kerikeri Arts and Winery Excursion: The township and environs of Kerikeri glory in the production of fruit and art. All along the side of the road you will find orchards selling their delicious produce and signs indicating the presence of a potter, painter, leadlight artist or sculptor. Today your guide will tailor your Kerikeri Sightseeing Excursion to your interests. You may wish to visit historical sites including the Kerikeri Mission House, the country’s oldest house and the Stone Store. The true highlight of this excursion is enjoying a sumptuous lunch and a glass of matched wine at an estate winery. Waitangi Treaty Grounds: The birth place of the nation, this is the location of the signing of the Treaty of Waitangi. It was here on February 6th, 1840, that this treaty establishing New Zealand’s first British governor and recognizing Maori rights as citizens and landowners was signed between the Maori and the British Crown, . Swim with the Dolphins: Enjoy the ultimate marine mammal experience. Viewing marine mammals and swimming with wild dolphins in their natural habitat is a privilege and a truly remarkable experience. 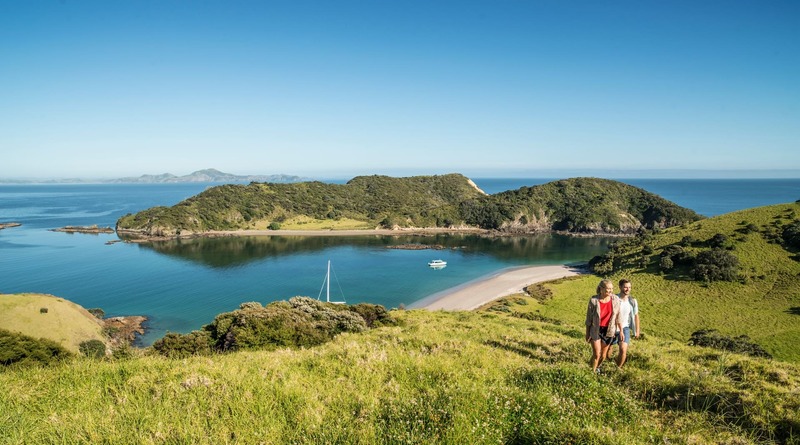 You may also have the opportunity to see magnificent semi-resident whales of various species, penguins, and other wildlife amidst the spectacular marine environment of the Bay of Islands. 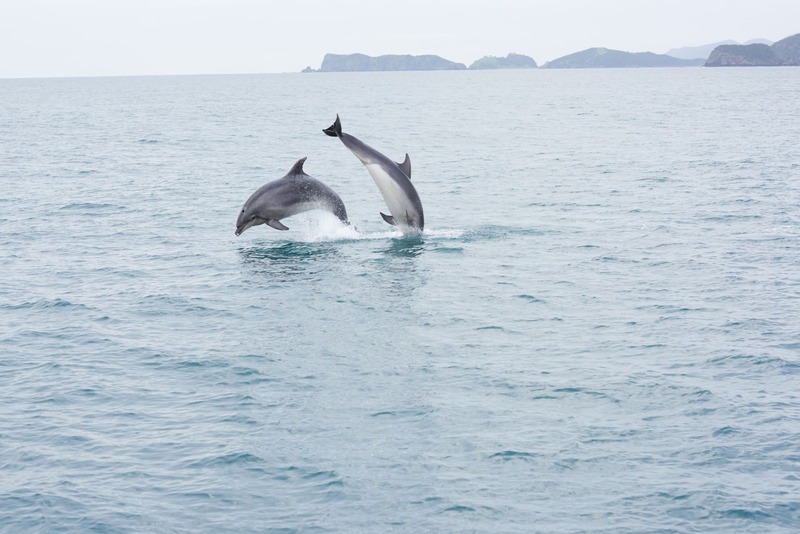 The Bay of Islands is a popular location for marine mammals as it provides them with an important food source and resting area due to the protection offered by the surrounding landscape. A Round of Golf at Kauri Cliffs: A magnificent golf course set high on the cliff tops with panoramic sea vistas for 180 degrees. This course is reminiscent of Pebble Beach. Fifteen holes view the Pacific Ocean, six of which are played alongside cliffs that plunge to the sea. The beautiful inland holes wind through marsh, forest and farmland. Designed and built by David Harman of Golf Course Consultants, the par 72 championship golf course has it all – length, variety, and unique challenges! Scuba Diving: Enjoy magnificent subtropical diving in the beautiful Bay of Islands. Enter a world of deep canyons, caves and pinnacles. Explore the unique sites of the spectacular Deep Water Cove and dozens of other bays and islands. You’ll find a multitude of friendly marine life, including moray eels, fish, octopus, stingrays, manta rays and the occasional marine mammal. Discover volcanic rock reefs and large kelp forests teeming with fish life. With countless dive sites to choose from, including the wreck of the Greenpeace boat Rainbow Warrior, the Bay of Islands is the premier place to scuba dive in New Zealand. Tonight we recommend you enjoy the classic kiwi ‘Fish & Chips’ on the beach. This morning, you will be transferred to Kerikeri Airport by private vehicle in time for your departing flight, or continue onto your next Willing Foot destination.